Boomslang Plug n Play Harness - Haltech Elite - Pann Auto Performance - San Diego largest aftermarket automotive performance parts - What do you drive? These are harnesses for the use of Haltech’s Elite 1500 and 2500 units. The Elite has full control of fuel and ignition timing. Choose your specific vehicle in the dropdown menu and then select the Elite unit you wish to use. Eight cylinder engines are best suited to the Elite 2500 to retain sequential injection and direct fire ignition. Six cylinder engines are best suited to the Elite 2500 to retain sequential injection and direct fire ignition. Four cylinder engines can be operated with any of the available Elite units and still retain sequential injection and direct fire ignition. 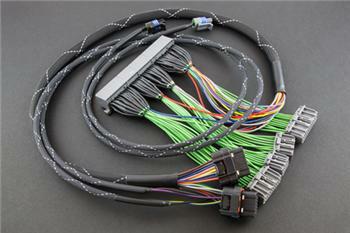 Dodge/Hyundai/Kia applications include a mandatory aftermarket coil driver wired into the Boomslang harness.